Hamza Yusuf is a difficult man to figure out. As a new IPT profile on Yusuf shows, he believes that American culture "revels in" war and violence. He has argued that Muslims, including the inspiration for the 1993 World Trade Center bombing, do not get justice in American courts. Yet, unlike one of his partners at Zaytuna, he has never flinched in acknowledging Muslims were behind the 9/11 attacks. He apologized for having called Judaism racist. He was embraced by the Bush White House after 9/11, but often sees America as a malevolent force in the world. Yusuf is founder and president of Zaytuna College in Berkeley, Calif., which seeks to become "the first accredited Muslim college in the United States." He also is a popular speaker and oft-quoted source in the media. In a 1995 lecture, Yusuf said the religion was racist because "…The Jews would have us believe that God had this bias to this small tribe in the middle of the Sinai Desert and all the rest of humanity is just rubbish." Yusuf publicly expressed regret for the statement years later, saying that "anti-Semitism, anti-anything does not reflect my core values." He urged people to "see my spiritual growth, as a person, as a religious scholar." That evolution hasn't changed his views of two high-profile prosecutions of Muslim activists. Two days before 9/11, Yusuf spoke at a fundraiser for Jamil al-Amin, then on trial for murdering a sheriff's deputy in Fulton County, Ga. Al-Amin was framed, Yusuf argued, in order to "silence" him. Al-Amin "is a dangerous man. It's a dangerous man who will speak the truth." Al-Amin was convicted of murder the following year. At the fundraiser though, Yusuf seemed to suggest that America's "institutionalized racism" was linked with Brown's plight. "We can't buy the stale rhetoric of human rights because we have not seen the proof of it," he said. At the same fundraiser, he also said that Sheikh Omar Abdel-Rahman, convicted in a conspiracy to bomb New York landmarks in the 1990s, was unjustly tried. Citing former U.S. Attorney General Ramsey Clark, Yusuf claimed that the "Blind Sheikh's" conviction went "against any standards of justice in any legal system on this earth, and now he sits in a jail because it was already a foregone conclusion." Abdel-Rahman is serving a sentence of life plus 65 years for crimes that include conspiring to murder former Egyptian President Hosni Mubarak, and plotting to bomb the Lincoln and Holland Tunnels, the George Washington Bridge, the New York FBI headquarters, various military installations and the United Nations building. After 9/11, however, Yusuf tempered much of his radical ideology. He often condemns terrorism. But he still sees the United States as an inherently hostile nation, one that "relishes war." Unlike Zaid Shakir, his colleague at Zaytuna College, Yusuf readily acknowledges that the 9/11 attacks were the work of Islamic extremists. Shakir says there are "glaring weaknesses and inconsistencies in the official narrative" about 9/11 and allows his writings to be republished by a website devoted to 9/11 conspiracy theories. Within a week of the attacks, however, Yusuf told the San Jose Mercury News that it was shocking to him that there are "any Muslims – no matter how statistically insignificant their numbers – who consider these acts to be religious acts … And therefore we as Muslims have to ask the question, 'How is it that our religious leadership has failed to reach these people with the true message of Islam?' Because the acts of these criminals have indicted an entire religion in the hearts and minds of millions. These people are so bankrupt that all they have to offer is destruction." Yusuf added that: "If there are any martyrs in this affair [9/11] it would certainly be those brave firefighters and police that went in there to save human lives and in that process lost their own." He told the Wall Street Journal that some Muslims were in denial over what happened. "They are coming up with different conspiracy theories and don't entertain the real possibility that it was indeed Muslims who did this. Yet we do have people within our ranks who have reached that level of hatred and misguidance." Such remarks helped Yusuf become a more visible representative of Muslim Americans. He attended the presidential address on Sept. 20, 2001, sitting near Laura Bush. He was at the White House that same day, where he said "Hate knows no religion. Hate knows no country. Islam was hijacked on that September 11, 2001, on that plane as an innocent victim." Last year, Yusuf was one of nine imams who appeared in a July 2010 anti-terrorism video released by the Muslim Public Affairs Council (MPAC) explaining that religiously motivated violence is wrong and contradicts the teachings of Islam. On other issues, however, Yusuf appears conflicted about what kind of country the United States is. His speeches include frequent references to the innate goodness of the American people and benefits of the Constitution and the Bill of Rights. But when it comes to America's role in the world - and the war against jihadist terror in particular - Yusuf on multiple occasions has portrayed the United States as a malevolent force. In another public appearance, Yusuf questioned the premise that the American people do not want to go to war. He then proceeded to suggest that the opposite is true - that American culture "revels in" war and violence. During remarks made in 2006, Yusuf disparaged television journalist Tom Brokaw's book The Greatest Generation, a tribute to the American soldiers who won World War II (Yusuf mistakenly refers to it as "The Great Generation"). "The Great Generation bombed Hiroshima and Nagasaki with nuclear weapons. The Great Generation is guilty of war crimes against huge civilian populations in Germany – Hamburg, Dresden. We don't like to think about that, because collectively, 'all of the Germans were guilty.' We demonized them." America is "a society that relishes war," Yusuf said. The abuse of Iraqi prisoners at the Abu Ghraib prison "is a direct result" of the fact that too many American children grow up watching violent television programs and movies. "We are Abu Ghraib, and that is part of us," Yusuf said. 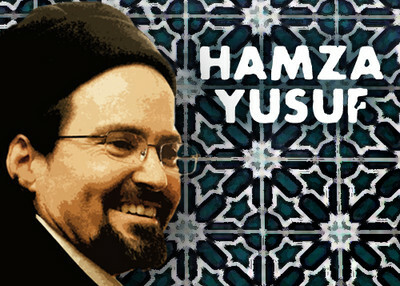 Read our full profile of Hamza Yusuf here. I don't understand why you consider him "difficult to figure out". He deplores and has spoken out against terrorism. He lauds some of the principles of freedom in the USA. He condemns some of the bad parts of the USA: our foreign adventurism, our hedonistic culture and our export of that culture. Do you think everything in the US is bluebirds and sunshine...? He thinks a couple cases of prosecution of Muslims (out of thousands) are perhaps suspect. I'm not sure I agree but then, millions of Americans think OJ Simpson was unfairly prosecuted, so it's not like disagreeing over court case outcomes is un-American. His original comments on Judaism are not really that "racist". I don't agree with it and he's retracted it, but Yusuf is hardly an anti-Semite. He's pointed out that his sister married a Jew and converted to Judaism, and he is quite familiar with the religion. It's not contradictory to state that the average American prefers peace over war, and yet also say that the American culture "revels in war and violence". Have you been to the movies lately? You go a bit overboard when you say he "allows his writings to be republished by a website devoted to 9/11 conspiracy theories." More like people quote him on their websites and he doesn't have the resources/interest to hire attorneys to track down every use of his words (assuming there is even a way to have it removed). Hamza Yusuf is genuinely one of the good guys. America in any way was haram by Shariah. agenda. At this stage I am giving you the benefit of the doubt. was meaningless to vote on something clearly wrong. friend, and ask yourself if this is the type person you want to be. given I am not hard to find, I will have to resort to legal action.